The first time I saw that monstrous room, it gave me the creeps. It’s a dark and dismal place filled with ornate antiques perfectly arranged for maximum dread. Now, I have to make my way past without looking in. I wonder what it means to be an antique, I thought to myself. Antiques are things that belong to dead people— that's what they are; and now they have a new home in my aunt’s Victorian room residing in the blackness at the top of the stairs. It’s time for bed. As I make my way toward the stairway of fear, I can see the reflective glow from the floral glass lamp bounce off an old portrait hanging in the dimly lit hall. The golden light reflects on the white-haired man’s face warming his ivory flesh-toned skin and rosy pink cheeks. It’s the eyes that get you. His black eyes follow you up the stairs as if he knows it’s bedtime. The aged pine staircase leads to the second floor of the renovated farmhouse. I rest my bare foot on the first step and wait. The parched wood winces under the pressure. My heart leaps into my throat. I take a deep breath and put a death grip on the darkly stained railing. Taking the remaining steps two-by-two, I slip around the sharp corner rail and make a giant leap into my bed. Whew! I made it, but I am not free from my overactive imagination. My headboard shares a wall with that room. It waits to invade my thoughts—creating an inevitable nightmare—haunting me while I am under its control. I shoved a timeworn portable radio beneath my pillow, but static interrupts the music and prevents me from putting my mind to rest. I could only think of delicately carved faces of the little cherubs dancing on the enormous cherry headboard. I can hear them giggling to the devious dolls seated in the elaborately embellished wing-backed chair that sits solitary in its corner. The dolls have had a long, hard life. Their attractive faces and porcelain skin bare the cracks of time. They want you to love them, but their cold dead eyes deter you from being part of their evil plan to escape from that sorrowful room. A musty smelling paper covered globe sits next to a small writing desk. The world looked strange back then. The ancient worlds had strange names that I don’t recognize. I envision the previous owner sitting in the matching velvet chair planning a trip to exotic lands in a steamer headed across the Mediterranean. Perhaps he is sitting there right now! Burying myself deeper into the thick and cozy feather quilt, I find the floral scent calming and comforting. My body starts to relax and my lids start to get heavy. I just have to make it through the night. Hudson Valley, NY resident Donna Davies, dubbed the “Halloween Queen,” divides her time between authoring children’s books, lecturing to both adults and children, and curating several web sites dedicated to the holiday. 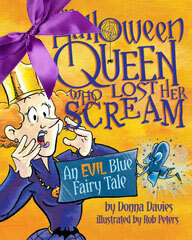 Ms. Davies’ first picture book for children, The Halloween Queen Who Lost Her Scream, thrilled audiences from 6 to 60 upon its release last October and earned her numerous opportunities to present the book at libraries across the region. 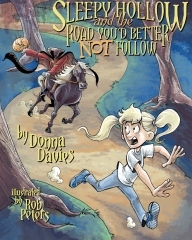 She has released her second children’s book, Sleepy Hollow and the Road You’d Better Not Follow through her publishing company All Hallows Eve Press . Creepy! What is it with dolls? The very things we love as children take on a much sinister aspect as we age it seems. I will definitely look for the books, the covers are amazing and my little niece is very much into all things Halloween!